She worked at Atlantic Beach Seafood. His family owned the place. 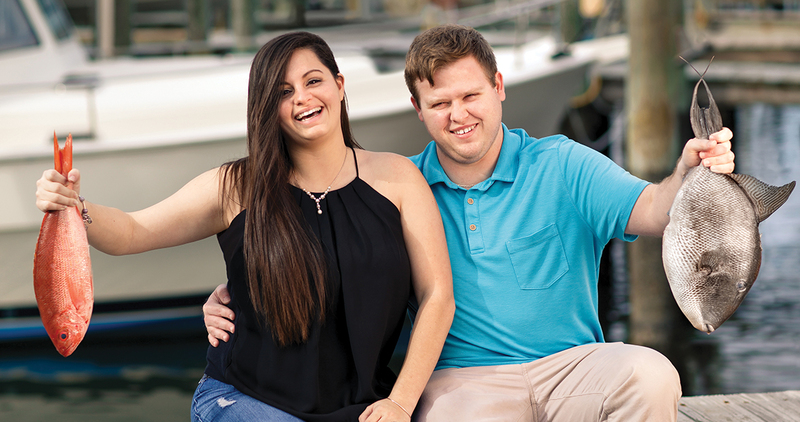 Now, Kamile and Chandler Willis are running the Carteret County institution where the shrimp is hand-packed, the oysters lead to stories, and one spouse (gasp!) doesn’t like seafood. Chandler Willis wants his greentails to lie flat. He wants their (headless) heads all facing the same way, and he wants those heads to come right up to the bag’s zip-lock strip, with no room for air. As a rule, raw shrimp — whether they’re summer’s brown or fall’s sweet greentails — don’t look very appealing crammed into a plastic baggie, but Chandler’s are intentionally, meticulously packed, so that when you open your cooler or freezer, you’ll pause, and be awed. This perfectionism and customer service is what happens when your every memory is of a childhood spent in a seafood store. Chandler’s great-grandfather Headon Willis opened the first seafood market in Salter Path — “on the island,” as one of Chandler’s mothers, Wrenn Johnson, says — in 1943. One branch or another of the Willis family has been selling seafood caught off North Carolina’s coast ever since. Headon’s sons, Wade and Brinkley (Brink for short), continued the market in Salter Path. Brink’s daughter Sonya, along with Wrenn, opened a new store, Atlantic Beach Seafood, in a 500-square-foot, concrete-floored space in 1999, three years after Sonya had Chandler. He’s now 21, and grew up in Atlantic Beach Seafood. Literally. “Chandler had a pallet on the office floor,” his wife, Kamile, says, “and when Sonya was writing checks, he’d take his naps there.” In this family business, three generations of women have played prominent roles. “Adrienne, Connie, and Sonya” — Chandler’s great-grandmother, grandmother, and mother, respectively — “were the heart of the business,” Wrenn says. They were the owners, ice haulers, packers, deveiners, check writers, and accomplishers of whatever else needed to be done. Connie, in particular, brought a new dimension to the market, its customers, and the entire Atlantic Beach community with her homemade pies, chowders, and secret-recipe shrimp cheese balls. 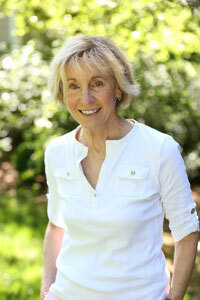 Connie died in 2015, at 69, only days after the business embarked on a new phase. Sonya, who had always worked side by side with her mother, stepped back as well, so that the next generation — Chandler and Kamile — could take Atlantic Beach Seafood to the next level. “Chandler has gone from getting in everyone’s way with his Hot Wheels, to running it,” Wrenn laughs. In March 2016, Atlantic Beach Seafood moved two blocks down the canal on the causeway, and graduated to a space 10 times larger, in what had formerly been a bar and nightclub. True to history, the renovations — from carpentry to painting — were all done by family and friends Chandler grew up with. Chandler himself laid the tile. Chandler and Kamile have been together since they were 14, and started working together at 16, when Kamile got her driver’s license. She got a ticket soon thereafter, and got a job at Atlantic Beach Seafood to pay off the fine. For their first date, a high school Christmas dance, Chandler showed up smelling like oysters. An hour before the date, he’d been washing oysters, always in demand — and in season — at Christmas. A shower didn’t help. Such is the life (and the scent) of the child of a family with a seafood store. The pair paid for their 2015 wedding by opening a wine and artisanal olive oil market beside the seafood store. 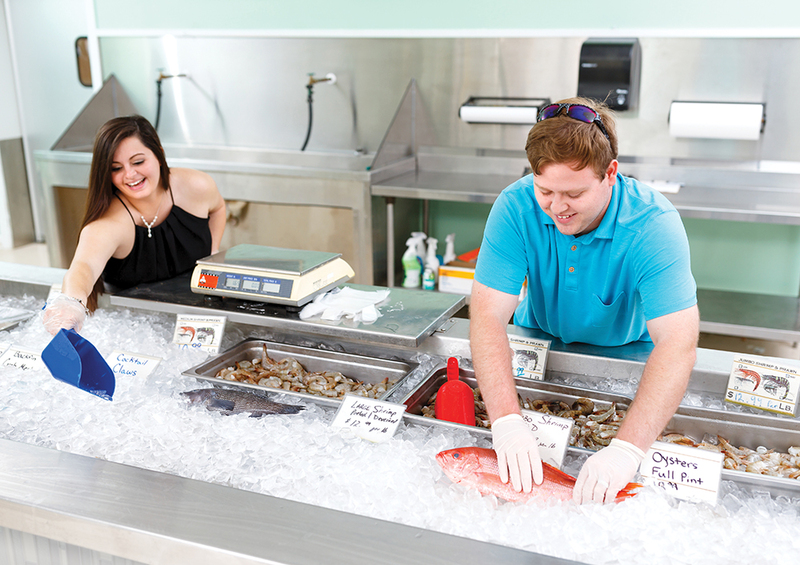 Now, they’ve combined both enterprises under one roof, as Atlantic Beach Seafood & Fresh Market. When you’re considered an institution, though, change can come hard for some folks. Especially at a vacation location like the beach, where many customers’ memories and rituals are bound up in the visit to buy those 10 pounds of shrimp for their annual 20-guest shrimp boil dinner, or tuna and mahi for their grills. “They miss the mom-and-pop atmosphere of the old place, even the old cash register,” Kamile admits. Most, though, love the spacious new digs, and what’s on offer. Including, now, steamer pots. Atlantic Beach Seafood will fill a tin can specially made for steaming with fresh whatever-you-like — typically, shrimp, clams, small lobster tails, and other shellfish — along with spices, corn, onions, and potatoes. Kielbasa, too. Take it to your house, hotel, or condo, and plug it in for a Low Country boil. Every family business has a head-scratching quirk, though, and this is Atlantic Beach Seafood’s: Chandler doesn’t like seafood. Never mind. Traditions will triumph. Pierce Johnson Willis, representing the third generation of Willises at Atlantic Beach Seafood, will be born this month, and Kamile’s gotta-have pregnancy craving is, of course, oysters. What’s Your Crystal Coast Beach Personality?